How is it possible to ensure you get the best results from Laser Eye Surgery? It can be hard to select an option when searching for a clinic on the internet. Some surgeons may be cheaper than others, while some clinics might have better reviews, but when it comes to any type of surgery, there are 3 main factors you should always consider. In this article we share with you the recipe for Laser Eye Surgery success. Although there are many talented surgeons of all ages in private practice and the NHS, we would always recommend that you seek out experienced surgeons with an excellent reputation. Laser Eye Surgery is a very particular skill and is still relatively new in the medical world – it makes sense to choose a leading expert! Our Founder, and Medical Director is Dr CT Pillai, one of the foremost laser eye surgeons in the world, with over 25 years of ophthalmic experience. He is also one of the few UK surgeons to have been awarded a Fellowship in Corneal and Refractive Surgery. Dr Pillai has performed over 20,000 laser eye procedures, and regularly presents lectures at national and international refractive conferences. Our other specialist surgeons are Dr Goran Helgason and Professor Martin Filipec. Goran has 25 years of laser surgery experience and is a pioneer in the surgical use of Implantable Contact Lenses, while Martin is a scientific advisor to the major eye care companies Zeiss and Alcon. It is safe to say that we have one of the most skilled and highly respected surgical teams in the UK! Any leading laser clinic should always keep updated with the latest technological advances. This will ensure that the quality of patient care constantly improves. At Advanced Vision Care, we re-invest in premium equipment on a regular basis, and this can be demonstrated with our recent purchase – the Bausch & Lomb Technolas TENEO 317 Laser. 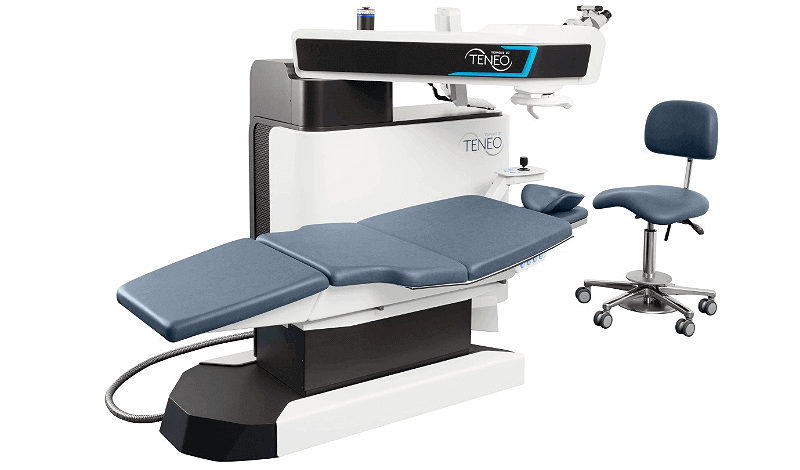 The fastest and newest excimer laser that is currently on the market, the TENEO 317 provides patients with some of the best possible outcomes. Typical treatments of just 3 seconds, reducing any damage to the cornea and encouraging a quicker recovery. Suitable for a wide range of eye issues – short-sightedness, long-sightedness, astigmatism and presbyopia. It provides precise optical sculpting by accurately evaporating tissue from the cornea’s collagen layer. In addition, the machine has a highly advanced eye-tracker which repeatedly takes images of the eye during treatment, detecting even the most subtle movement, with a response time of 2ms! This ensures that patient safety remains paramount. There is also an iris recognition system which is a thousand times more accurate than a fingerprint, meaning that all our laser treatments are ultra-specific. Put simply, this laser is capable of curing myopia, hyperopia, and astigmatism in seconds. Once the procedure has taken place, it is essential to have access to a high-quality, easily accessible aftercare service. While serious problems are rare, expert follow-up care allows any issues to be spotted at an early stage, effectively minimising the risk of complications. Aftercare can be as important as the surgery itself, and often sets leading clinics apart from their cheaper competitors – you know you are in safe hands and that any issues can be rectified quickly. We are the only eye clinic to give patients the benefits of surgery at Harley Street premises, and aftercare appointments at one of our regional partners – our optometrist network expands across the UK and all our partners are full trained professionals with years of experience. Being able to access aftercare at a location near to your home saves time, money and effort! If you would like to find out more about Laser Eye Surgery at Advanced Vision Care and how it can completely transform your life, then why not call AVC TODAY on 0800 652 4878 and request your free information pack or book your consultation to find out how we can help you.